Brussels is a good tourist spot. It is a mix of the old and the new. Some of the areas exude old age charm. The cobbled streets, the quaint shops, cafes and restaurants really make you feel like staying there for more days. 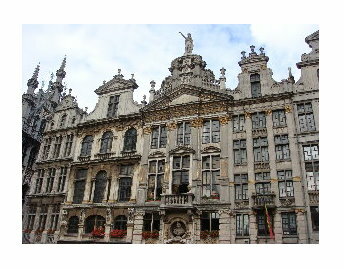 The most famous tourist spot within the city is the Grand Place which is a central market square. It has the Town Hall (Hôtel de ville), the Guild houses and the Breadhouse (King’s House). Each of these are magnificent. It was between 1402 and 1455 that the Town Hall was constructed. It has a beautiful Gothic Tower, on which there is a statue of St. Michael considered the patron of Brussels. Before the present structure of the Breadhouse, it was a wooden building in the 13th century where bakers sold their produce. It was converted to a stone structure in the 15th century and later into the Neo-Gothic style edifice in the 19th century. This is just across the Hôtel de ville and is also known as the Maison du Roi (or King’s House). It did not belong to the king ever but the King’s instructions were usually read from here. Hence the nomenclature. The Grand Place came under attack in the 17th century war with France. It was almost razed to the ground. But the square was rebuilt by the Guilds under planned supervision. Hence the new layout has an organized look though the styles vary from Gothic to Baroque to Louis XIV. 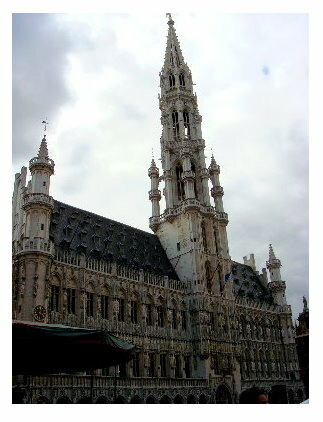 In 1998 UNESCO named the Grand Place as a World Heritage Site. The Guild halls have facades conforming to the relevant occupations or the original occupants. The Swan guildhall housed butchers, the Pigeon guildhall housed painters, the Brewer House the inevitable!. Today these guild houses have restaurants, hotels and shops. A flower market is held here every Sunday morning. Every even year in August the centre of the Square is covered in flowers. It is called the Tapis des Fleurs. The Square is a good place to hang out in. There are small eateries and good restaurants here where one can sit outside and enjoy the food and the place. This is also a place where musical performances take place at times. It gives a very festive, jovial feel to the place. It is a tourist favorite, so be sure to encounter large number of people in the square. The that adds to the charm. 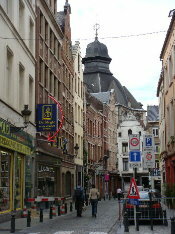 There are a number of small streets leading from the square. They have a variety of shops and eateries. 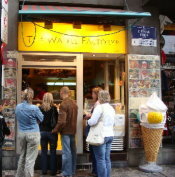 The most famous of them are the small shops selling Belgium Waffles. One must try these Waffles – they come with a number of toppings – cream and banana, strawberries, nuts et al. The Central Station (Gare Central) is close by. You can also take the metro to De Brouckére or Parc. It is walking distance from these places. You can also take Taxi or car. You can check out the details of getting around in Brussels and other Tourist info here. More details about means of transport at the official site. Picture on the right: Mmmm…a Belgium Waffle. Belgium is a country of about 30,500 sq. km with a population of over 10.3 million. It is a parliamentary democracy with constitutional monarchy. It gained its independence from Netherlands in 1830. It is bordered by France, Germany, Luxembourg, Netherlands and the North Sea. It has rather mild climatic conditions. Cool summers, mild winters and often rainy and humid. It averages about 45°F in winter and about 75°F in summer. It is nevertheless pleasant. But it’s better to have an umbrella/raincoat with you. The country has three official languages – Dutch or “Flemish,” French and German. This adheres to the ethnic make of the population too with the Dutch speaking region, Flanders in the north and the French speaking region of Wallonia in the south. Belgium is a highly industrialized country with a good manufacturing base and an excellent transportation network. The industries are concentrated more in the northern Flemish areas. Around 3/4th of its trade is with other EU countries. Euro currency started here in 2002. It is one of the founding members of the European Union. It is nicknamed Capital of Europe and Comic city. Its capital Brussels is in the centre and is bilingual. It is known as the capital of European Union (albeit de facto) since it is the administrative center of the EU. The Head Quarters of NATO, EUROCONTROL and Western European Union are situated in Brussels. To be specific, the capital is actually the City of Brussels municipality, which is the largest municipality of the Brussels Capital region. There is plenty to see and enjoy for a tourist in Belgium. Belgium has rather mild climatic conditions. Cool summers, mild winters and often rainy and humid. The average temperatures range from about 40 – 45°F in winter and about 70 – 75°F in summer. It is nevertheless pleasant. It is good to layer oneself so as to adjust clothing accroding to the weather! And it’s better to have an umbrella/raincoat with you. Working days are from Monday to Friday. Banks are open from 9 AM to around 4:30-5:00 P.M. Some are open on Saturday first half. Stores are normally open till 6 P.M. and on Fridays they could be open late. Very few are open on Sundays too. As in any other European country, Belgium runs on 220 volts electricity whereas U.S. and Canada uses 110 volts. Hence during travel to Europe one must carry a voltage adapter/transformer for appliances like hair dryer, chargers etc. Belgium has three official languages – Dutch, French and German. Brussels is the capital of Belgium. It is best seen on foot. It is a good experience. There are numerous means of transport for getting around Belgium and Brussels in particular – train, metro, tram (streetcar), bus, taxis or cars. The tram, metro and bus service can be opted for using the same ticket. You can take a single journey ticket, five journeys or 10 journeys ticket or a one day ticket. One can hop on and off these vehicles and it is very convenient. The ticket needs to be validated every time you get into a vehicle. Though for one hour after the first validation, the transfers are free. One can get taxis from the designated stands. Unlike NY, you cannot hail a cab in the streets. Also there the meter price includes tip. No extra tip needs to be given. Societe Nationale des Chemins de Fer Belges SNCB (Belgium), is the Belgian national railway operator. It was created in 1926. The NMBS/SNCB is an autonomous government company. This has the facility of taking your car with you. It is cheap and fast but might be little wanting in comfort. It provides a comprehensive rail service in partnership with Thalys, Eurostar and TGV network. This is a high speed rail service from U.K to France and Belgium through the Channel Tunnel (or Chunnel!). It tarted its operation in 1994. It takes a little more than two and half hours between London and Paris and about 2 hr. 15 min. between London and Brussels. This service runs daily. It also offers connecting tickets to 100 destinations across France, Belgium, Germany and the Netherlands. The fares from London to Belgium for standard class ranges from €50 (or €100) single ride for passholder type to €199 (or €398 return) single for fully lexible type. Its higher for the Leisure Select and Business Premier Class. This is a high-speed European Rail Network connecting France to London, Brussels, Geneva, Zurich, Milan, Torino etc. The Gare Centrale (1000 Bruxelles) station is the closest to a number of city attractions. Other train stops include Gare du Midi (Rue de France 2, 1070 Bruxelles), Gare du Nord (Rue du Progrès 85, 1210 Bruxelles). These are well connected through other means of transport like streetcars/trams, taxis and subway (Metro). The Gare Centrale has a subway station (or Metro station) nearby along with bus stops and taxi stands. The most convenient way of travel in Brussels, the Metro forms the underground network. 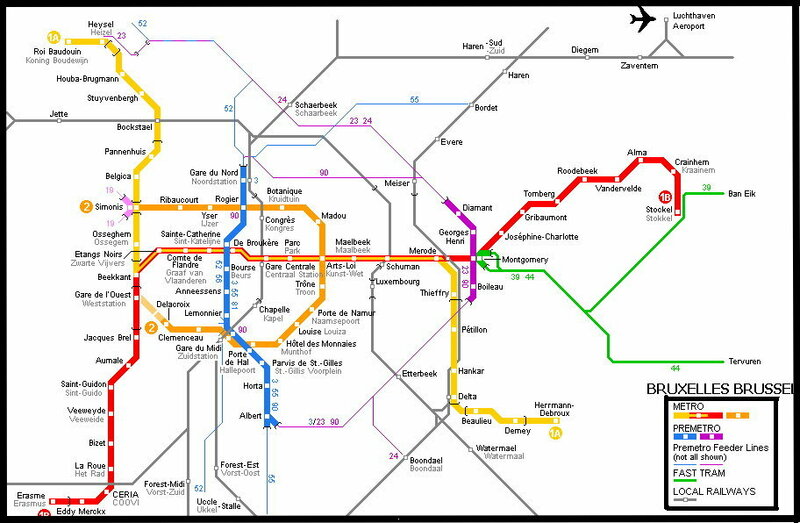 The STIB runs the metro, tram and bus lines. All details and the trip planner are available in their official site. For both domestic trains and trains to other Euro countries (for Thalys, TGV, Eurostar) call 02/5282828. Belfry (Belfort) of Bruges .